Nova Ocean View. Located in a quiet residential area, this low-rise building is just 300 metres from the beach and has plenty to offer for day-to-day living. Nova Ocean View provides all residents full access to all the communal facilities - a rooftop swimming pool with sea view, sun deck, and fully equipped fitness centre. Pratumnak Hill is a quiet location nestled between the hustle and bustle of Pattaya City, and the more slowly paced environment of Jomtien Beach. However getting to either is a very easy thing so you have everything on your doorstep. This open studio has a nice 46 square metres of living space which is sufficient space to keep this property light and airy. 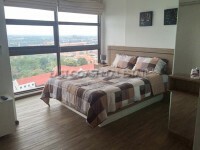 It is available fully furnished and has a nice wide European kitchen, bright bathroom with rain shower and a balcony. The advertised price of 15,000 Baht per month is for a 1 year contract. A shorter period of 6 months is available at request. 2 month security deposit will be required prior to check-in.